I Recently returned from a wonderful week of Jewish community and learning at the National Havurah Institute. As I was preparing for a workshop I taught on community investing (a project from earlier in my work life), I found a connection with the fair trade world, bringing together two of my passions! It turns out that Oikocredit is one of the world’s largest sources of private funding in the microfinance sector. They also provide credit to trade cooperatives, fair trade organizations and small to medium enterprises in the developing world. Kuapa Kukoo, now a cooperative comprised of more than 45,000 cacao farmers in Ghana, was formed In the 1990’s. Over the years, it grew into Divine Chocolate, Ltd in England, the only farmer-owned chocolate company in the world. Sufficient profit was made that the farmers in the Kuapa Kokoo cooperative began to receive dividends beginning in 2007. In addition, the fair trade premium pad for cocoa is used to construct and improve drinking water wells, primary schools, and other community projects decided by the farmers themselves. 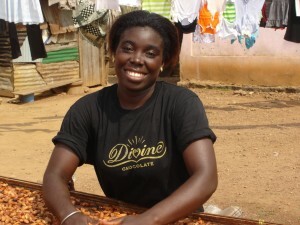 When Divine Chocolate decided to enter the U.S. chocolate market in 2006, Oikocredit stepped forward with investments in the new division as well as a line of credit. In the past 5 years, Divine US has become a significant player in the fair trade chocolate market, including being the largest provider of Fair Trade Kosher Chanukah gelt!